An Historic Royal Occasion Celebrated on the Latest £20 Coin - the first combined portrait of The Queen and Prince Philip on an official UK coin for ten years. In 2017, we celebrate the platinum wedding anniversary of Her Majesty The Queen and His Royal Highness The Prince Philip, Duke of Edinburgh. Experienced coinage artist John Bergdahl has created an equestrian portrait for the reverse of this £20 coin, with both Her Majesty and Prince Philip on horseback. 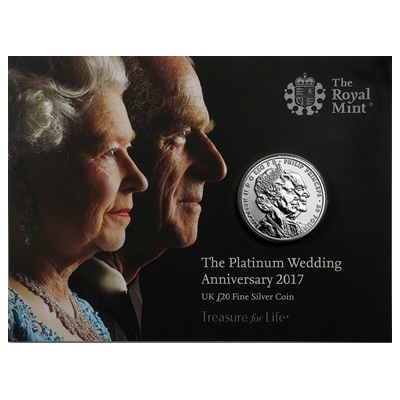 For the coin's obverse, leading figurative sculptor Etienne Millner has created a double portrait depicting the royal couple. A Limited Edition Presentation of just 70,000. 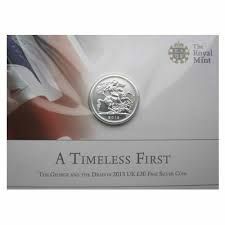 Struck in 999 fine silver and finished to Brilliant Uncirculated standard.